Wildflower of the Week is written by Club member Jim Poling and features seasonal flowers. Jim is the coordinator of “Wildflower Walks in Black Mountain”, usually held the second Thursday of each month. Most of the walks are local—Montreat, BMT Recreation Park, Warren Wilson College. There may be one or two trips to the Parkway. Meet at Lake Tomahawk Parking Lot on Rhododendron Ave. Black Mountain, NC to carpool to another location where there are wildflowers! Next Wildflower Walk will be Thursday May 9th. For more information contact Jim at jnpoling@icloud.com. Trillium flowers are blooming, starting several weeks ago at lower elevations, and now into our area, including Craven Gap. With its large leaves and white petals, Large-flowered Trillium is the most common of the Trillium family in our area. It is beautiful with yellow anthers (caused by pollen) and a pale green ovary (the center of the flower). Once you become familiar with this flower, then you will also notice other Trillium species: Sweet Betsy, Stinking Benjamin, Yellow Trillium, Painted Trillium. I have great respect for these flowers because the flowering plants are 8-10 years old. That is, it takes 8-10 years for a plant to go from seed to flower. So if we disturb an area and destroy the adult plants, it takes a long time for them to recover. In the meantime invasives such as English Ivy, Privet, & Multiflora Rose can take over and eliminate any more plants for that area. Hopefully humans can manage the environment so that these beautiful native wildflowers can be with us forever. Leaves: 3 whorled leaves, entire, solid green, rhombic to mostly ovate, 3-6 in. long, veins prominent. Flowers: 3 regular, white, petals turning pink with age, 1.6-3.0 in. long, flaring outward from a tightly rolled, tube-like base; stamens long with prominent yellow anthers, pale green ovary. March-April. Fruits: Pale, green, ovoid berries, 0.5 in. long. Where Found: Rich woods from Canada, southward to Al and Fl. Frequent..
Notes: This showy species occurs in large colonies in the Appalachians at medium to low elevations. After germination, a trillium first produces only 1 leaf and requires another 6-7 years before it flowers for the first time. Pictures from Craven Gap on Thursday, April 18. Toothwort Wildflowers are members of the mustard family and most of the plant is edible, including the leaves and rhizomes. I have recently become aware that there are three species of Toothwort: Cut-leaved (Cardamine concatenata), Crinkleroot (Cardamine diphylla), and Slender Toothwort (Cardamine angustata), and they are harder to distinguish than I thought. All have three toothed leaflets that can be basal or stem leaves. However, only the Cut-leaved species lacks basal leaves during flowering. Slender Toothwort has slender stem leaves and ovate basal leaves; Crinkleroot has ovate basal and stem leaves. I promise to observe more closely in the future. While this is more detail than some people want, it is part of the challenge and beauty of botany to debate such questions. Sometimes when I stop to ponder such questions, I notice that the rest of the group has already moved a quarter mile up the trail. I am hoping that you will be able to notice some of the complexity and diversity of wildflowers, but it is OK just to enjoy the sheer beauty before us during the growing season. Size: 8-16 inches tall, flowers are 0.4-0.8 inches across. General: Perennial with short-hairy stems from a rhizome constricted at irregular intervals in sections about 0.75 inches long. Leaves: Toothed, whorl of 3 stem leaves, each with 3 narrow, toothed segments; basal leaves usually not present at flowering. Flowers: 4 petals, usually white, born in terminal clusters, March-May. Fruits: Siliques to 1.5 in. long with a short beak. Where Found: Moist rich woods throughout eastern US. Common. Notes: The rhizome and leaves of this plant are peppery tasting. The leaves can be eaten raw or cooked, like other mustard greens. Native Americans made a poultice from the root and used it to treat headaches. Horn, Cathcart, Hemmerly and Duhl, Wildflowers of Tennessee, the Ohio Valley and the Appalachian Mountains. 2005, p 114. Blue Cohosh, a small perennial 1-3’ feet tall, can easily be overlooked when walking on forest trails in the spring, even if it is flowering. The green leaves and tiny flowers blend in with the early undercover plants. However, when you notice this plant and study it closely, you will find it is beautiful. The greenish flowers are delicate; the leaves have a unique bell shape with three enlarged teeth at the end. It is blooming at 1,000 feet near Saluda and other lower mountain locations, and will soon be blooming at Craven Gap and nearby locations. Yesterday we saw over 50 species of blooming wildflowers near Saluda. Keep your eyes open for this and many other early wildflowers as spring progresses. Leaves: Single, large, sessile, 3-ternately compound leaf above the middle of the stem; 1 (rarely 2) smaller, but similar compound leaf just below the inflorescence; oval leaflets. Fruits: Dark blue, poisonous berry-like seeds. Where Found: Rich woodlands. Mostly a NE species that extends south to northern GA.
Notes: The genus Caulophyllum is from the Greek kaulin, a “stem,” and phyllum, “a leaf.” Native Americans used the roots of this plant to make a tea for facilitating childbirth and to aid in menstruation. The Cherokee would “hold root ooze in the mouth for toothache” and rub the leaves on poison oak rash. In the late 1800’s, this plant was also used as a sedative and an antispasmodic, as well as to treat hysteria, rheumatism, and bronchitis. Leaves: Basal only, on hairy stalks; leaves 1-3 in. wide, 3-lobed with rounded tips. Where Found: Rich upland woods commonly on acidic soils. Notes: The genus name Hepatica means “of the liver.” The Chippewa placed hepatica roots near their animal traps in the belief that this would help capture prey. Horn, Cathcart, Hemmerly and Duhl, Wildflowers of Tennessee, the Ohio Valley and the Appalachian Mountains. 2005, p 60. This will be my last Wildflower of the Week for 2018. Because of winter coming and travel plans, my outdoor wildflower season is over, except for reviewing my pictures and practicing my Latin. One week ago I especially enjoyed seeing the Striped Gentian (Gentiana villosa) on the mountain-to-sea trail from Big Ridge Overlook north. This blue and white Gentian was scattered along the trail, and I assume also growing deeper in the woods at 4,000-5,000 feet. It was a delight to find this wildflower with the help of my friends in the Western Carolina Botanical Club. I have been hoping to find a family of orchids called Ladies’ Tresses for most of this year after seeing them last summer near Brevard and the year before in Newfoundland. Yesterday was my lucky day because several gorgeous plants were growing right along the Blue Ridge Parkway near where my car was parked at Big Ridge Overlook, MM403. The book says that this is a common orchid found throughout western NC and it blooms in September and October. This orchid sends up a one foot tall stem, often braided in two stems at the top, with many small white flowers. On first appearance it looks similar to Rattlesnake Plantain (Goodyera pubescens) that blooms in July and August. But on closer inspection, it is more delicate and attractive. I hope to see more of the several varieties of Ladies’ Tresses Orchids in years to come. General: Slender stem may be smooth at the bottom but the entire upper part is sparsely covered with fine capitate hairs. Leaves: Several basal, very narrow leaves present at the time of flowering. Flowers: Rounded and very white flowers, although the lip has a yellowish flush on the interior because of its thickness. The outer part of the lip has a translucent quality not seen in other flower parts. Sept-Oct.
Where Found: Many different habitats from lower to higher elevations. It can be found along roadsides and in ditches. Notes: Spiranthes cernua is the most common species of the Spiranthes genus in the U.S., and second only to Goodyera pubescens, Rattlesnake Plantain, among the orchids. It often forms large colonies that can number hundreds of plants in wet meadows and roadside ditches. Stanley L. Bentley, Native Orchids of the Southern Appalachian Mountains, UNC Press, 2000, p 198. Horn and Cathcart list 28 species of Goldenrod (Solidago) in the Appalachian mountains. Weakley (Flora of the Southern and Mid-Atlantic States) says there are 90-110 species of Solidago in the Southeastern U.S. As a result, most of us despair of learning much about this family of wildflowers. At this time of year, their bright yellow flowers are dominant in the valleys, ridges, and high mountains. With luck, I found one species that I can identify, Solidago bicolor, Silverrod. It is the only species so far that is basically white, so it is easy to pick out. My botany friends identified another Goldenrod at Sam Knob’s meadow as Solidago roanesis or Mountain Goldenrod, named after Roan Mountain in Tennessee. It is a high elevation flower and common at Black Balsam Road. So maybe I can identify two members of the Goldenrod family. I doubt if I will get much more knowledge than this about Goldenrods. But still we can all enjoy their showy yellow colors in September and October. General: Perennial herb; solitary, soft-hairy stems and bicolored flower heads. Leaves: Alternate, narrowly elliptic, shallowly toothed, hairy, 2-5” long, reduced upward. Flowers: Ray flowers white, 7-9, 0.1-0.2” long; disk yellow; involucre, .1-0.2” long, bracts whitish with a pale green tip; heads radiate, in a narrow, spike-like panicle, July-October. Fruits: smooth achenes, 0.15-.02” long, taped from base to tip; pappus a tuft of whitish bristles, 0.3” long. Where Found: Dry woods, barrens, and open rocky areas. Notes: The genus Solidago contains perennial herbs with tiny, yellow flowers in showy clusters. Most Solidago species begin flowering in late summer, often signaling the beginning of hay fever season. However, Goldenrods do not cause hay fever, because the pollen is too heavy to be airborne. Ragweeds (Ambrosia sp.) are the usual culprits. Many (but not all) of the yellow flowers along the Blue Ridge Parkway are Sunflowers (Helianthus sp.). However there is one that looks very similar to a sunflower but is actually a False Sunflower. It is challenging, but fun, to distinguish the False Sunflower from one of the many native Sunflowers. You have to examine the petals closely. On the ray of the False Sunflower, there is an obvious pistil at the base (see picture below). This means that the ray flower is fertile and capable of producing a seed. On the native Sunflowers, the ray flowers are sterile and incapable of producing a seed. On both plants the disk flowers are fertile and can produce seeds. If you can learn this distinction and remember it from year to year, you can impress your friends with your knowledge. It is even better if you remember the Latin names: native Sunflowers are Helianthus; False Sunflower is Heliopsis. It gives you one more excuse to take you friends for hikes along the Blue Ridge Parkway. General: Stout, fibrous-rooted perennial herb with a smooth, erect stem. Leaves: Opposite, ovate-lanceolate, 2-6” long, petioled, serrated, smooth or rough, generally shorter and wider than those of sunflowers. Flowers: Ray flowers golden yellow, 8-16, 0.6-1.6” long, fertile with a forked pistil at the base; disk yellow, 0.4-1.0” wide, involucres hemispheric, bracts oblong, smooth tips spreading, heads radiate, showy, solitary or several on slender stalks, July-Sept. Fruits: 4-angled, slightly hairy achenes, pappus absent or a few short scales. Where Found: Thickets, woodlands, and stream banks. Notes: Only the disk flowers of Sunflowers (Helianthus spp.) form seeds (actually achenes), but both the disk and ray flowers of Oxeye plants form seeds. Horn, Cathcart, Hemmerly and Duhl, Wildflowers of Tennessee, the Ohio Valley and the Appalachian Mountains. 2005, p 355. Gentians belong to a wildflower family that blooms at the highest elevations of our mountains at the end of August and early September. I enjoy finding them south of Mt. Pisgah and at Mt. Mitchell. Last year I bought a Gentian from a local native plant nursery and it is blooming this week. On many species, the unusual flowers usually do not open; they are erect on the plant and are pollinated by bumblebees that force their way inside. There are some species in this family that have different characteristics, such as the Rose Pink (Sabatia angularis) that I discussed several weeks ago. I am featuring the Bottle or Closed Gentian (Gentiana clausa) this week. But keep your eyes out for other Gentian species in the high mountains, including Balsam Mountain Gentian (Gentiana latidens) at Wolf Mountain Overlook on the Blue Ridge Parkway and Stiff Gentian (Gentianella quinquefolia). The other picture is of the Gentian species from my garden. Size: Up to 20 in. tall. General: Perennial herb with erect, smooth stems. Leaves: Opposite, sessile, slender pointed leaves. Where Found: Most meadows, woods, a NE species extending south in the mountains to TN and NC. Notes: The Gentian species is named for the 6th C. king of Illyria, Gentius, who discovered that the roots of the Yellow Gentian (G. lutea) had a healing effect on his malaria-stricken troops. Horn, Cathcart, Hemmerly and Duhl, Wildflowers of Tennessee, the Ohio Valley and the Appalachian Mountains. 2005, p 221. In case you are wondering about the white wildflowers blooming now all over the mountains, they may be White Snakeroot. It is usually about 3’ tall and easily seen along most of the trails along the Blue Ridge Parkway. Since it is an aster without ray flowers, the tiny blooms (0.2”) are found in a cluster at the top of the stem. They are so common that we often pass by without giving them a second look. This week while hiking, stop and look this flower over. It brings life to our hikes when we appreciate them. Leaves: Opposite, ovate to heart-shaped, to 7 in. long and 5 in. wide, palmately veined; tips acuminate; margins sharply serrate; petioles over 1 in. long, but always shorter than the blade. Flowers: Ray flower absent; disk flowers bright white, 12-24; involucral bracts about 0.2 in. long, acuminate to obtuse, rarely white-margined; inflorescence a flat or rounded corymb-like cluster. Jul-Oct. Fruits: Achenes, usually about 5 per head, about 0.1 in. long; pappus a tuft of whitish, hair-like bristles. Notes: White Snakeroot contains toxins that can pass from cattle to humans through milk. In pioneer days this caused severe illness and often death. This “milksick” disease is thought to have killed Abraham Lincoln’s mother. White Snakeroot was included in preparations made bye several Native American tribes to treat fever, diarrhea, and problems of the urinary tract. Horn, Cathcart, Hemmerly and Duhl, Wildflowers of Tennessee, the Ohio Valley and the Appalachian Mountains. 2005, p 321. One of the more interesting wildflowers in fruit and seed is Doll’s Eyes. The leaves and flowers show similarity to another flower in the same genus, Black Cohosh, which blooms in August. But Doll’s Eyes bloom in May and develop fruits and seeds in August. The seed pods look exactly like Doll’s Eyes. It is almost uncanny when you look closely, and one can imagine placing these seeds in the eye sockets of a small doll. I came across this plant yesterday on the Bear Pen trail (MM427, altitude 5,500’) and marveled at its beauty and distinctiveness. No other wildflower looks the same. I remember first seeing this plant on one of my first wildflower walks at Coleman Boundary in 2011. I stopped and loved it then, and I still do. But don’t eat it because it is deadly poison. I hope you come across this plant and enjoy it like I did. Size: Up to 3 ft. tall. Leaves: Large, 2-3 compound, long-petioled; largest leaves may have more than 20 lobed and sharply toothed leaflets, 2-3 in. long. Flowers: Small, white, 4-10 narrow petals, each 0.1-0.2 in. long; flowers are grouped in a compact raceme at the end of the stalk, April-May. Fruits: Round, white, many seeded berries 0.3-0.4 in. across with a single dark dot at the tip, on thick, red pedicels, 0.5-1.0 in. long. Where Found: Rich woods through the U.S. and Canada. Notes: The name White Baneberry warns against eating the berries, which are poisonous. The other common name, Doll’s Eyes, comes from the resemblance of the fruit to the porcelain eyes once used in dolls. When crushed and mixed with alum, the berries produce a black dye. All parts of this species contain a cardiac glycoside, a powerful heart stimulant. Horn, Cathcart, Hemmerly and Duhl, Wildflowers of Tennessee, the Ohio Valley and the Appalachian Mountains. 2005, p 53. St. John’s-wort is blooming all across the western mountains of NC. There are more than half-dozen species that can be identified with a little effort: Spotted, Common, Mountain, Dwarf, St. Andrew’s, Bushy, Orange Grass, etc. We are featuring Spotted St. John’s-wort (Hypericum punctatum) because it is very common in our mountains, from the valleys to elevations of 5,000 feet. The distinctive opposite, rounded leaves and bright yellow flowers with many stamens are beautiful and easily identified with a little practice. I enjoyed the St. John’s-wort flowers near the Black Balsam Parking Lot on the Blue Ridge Parkway, and we expect to see several species at our walk next week. Size: Up to 40 in. tall. General: Erect perennial with a few branches below the inflorescence. Leaves, stems, sepals and petals are heavily black-dotted. Leaves: Opposite, oblong-elliptic to oblong-ovate, blunt-tipped and sometimes notched, 1.2-2.6 In. long and 0.7 in. wide riddled with black spots. Flowers: Bright yellow, 5 petals, about 0.25 in. long, spotted or streaked with black on the undersides, inflorescence terminal on the stem and branches, small and crowded with short-stalked flowers, Jun-Aug. Fruits: Capsules about 0.25 in. long. Where Found: Wet or dry areas throughout the eastern U.S.
Notes: Often confused with Common St. Johns-wort, but spotted St. Johns-wort has smaller, paler yellow flowers with black spots or streaks on the underside of the petals, not on the margins; the leaves are larger and more elliptic and have diffuse black spots, not translucent ones. Horn, Cathcart, Hemmerly and Duhl, Wildflowers of Tennessee, the Ohio Valley and the Appalachian Mountains. 2005, p 88. The Loosestrife wildflowers have attracted my attention. I first noticed the beautiful yellow flowers with reddish centers of the Whorled Loosestrife along my driveway at home. Last year at Craggy Pinnacle I discovered a shrub about 3-4 feet tall and identified it as Fringed Loosestrife. This summer I was amazed at a bed of yellow flowers with reddish centers in the meadow below Sam’s Knob, Black Balsam Road, Blue Ridge Parkway. 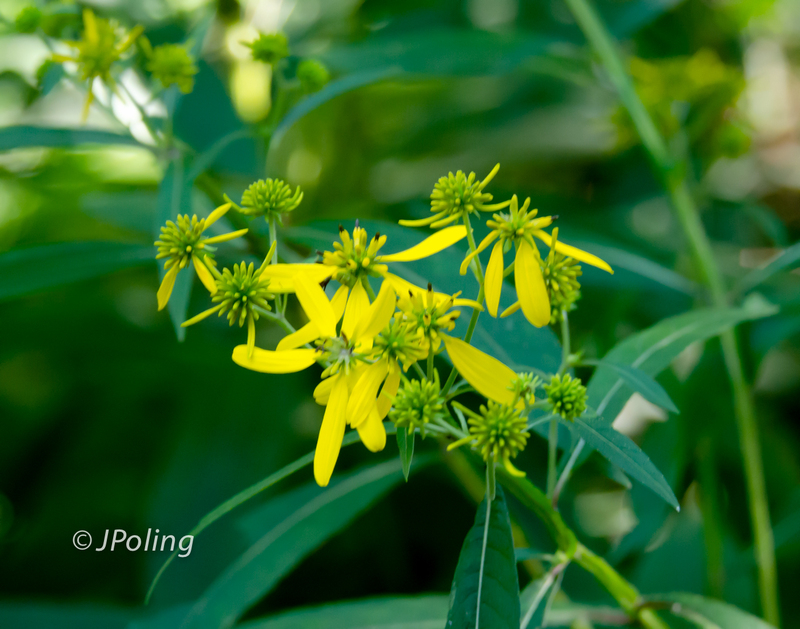 This plant formed a 12’ circlular mat of bright green and yellow in competition with many other plants. The flowers of these three plants are very similar in shape and color and they all emerge from the node where the leaf connects to the stem. But they are very different plants in size, shape, and location. Lanceleaf Loosestrife is “occasional,” and therefore more unusual than the other plants. I was delighted to find this beautiful species and hope to find it again. General: Herbaceous perennial plant 1-2′ tall and more or less erect. Leaves: The opposite leaves are up to 5″ long and ¾” across. They are lanceolate or narrowly ovate, and often fold upward along the length of the central vein. Their margins are usually smooth (although sometimes ciliate), and there are no hairs, except toward the base of each leaf. These leaves are sessile against the stem, or they have short petioles with a few coarse hairs. The uppermost leaves at the top of a plant are usually whorled. The underside of each leaf is light or whitish green, but eventually becomes darker with age. Flowers: From 1-4 nodding flowers develop from the upper axils of the leaves, each with its own pedicel. Each flower is about ¾” across, with 5 narrowly triangular green sepals, 5 yellow petals, and 5 yellowish orange stamens. The petals are well-rounded, but their outer edges are often ragged and may have conspicuous tips. Toward the center of the flower, there is a patch of orange surrounding the upper portion of the pistil. July-Aug. Fruits: Spheroid capsules with slender spike-like tips. Where Found: Although widely distributed, it is an occasional plant. Habitats include moist to mesic black soil prairies, open woodlands, thickets, swamps, gravelly seeps, limestone glades, and old fields with hardpan clay or sandy soil. I had an encounter with an infrequently occurring, beautiful wildflower this week. Fameflower is an unusual wildflower because of its location, size, and blooming pattern. This succulent plant is only a few inches tall and grows on rock faces in western NC. I have seen it in two places in western NC, but never in full bloom until this year. During most of the day the flower is closed and opens only for a few hours about 3-5 pm when the sun is bright. Thursday was my lucky day. I found the flower just north of the Folk Art Center and when I returned in the afternoon, dozens of plants gave the cliff a red and pink color to the rocks. Thanks to Janie Owen for alerting me to the presence of the Fameflower. Location: 1.4 miles north of entrance on BRP for the Folk Art Center, MM380, pull on west side, look on the Rock Face across the road about 3:00pm when the sun is shining (35.6090381,-82.4941147). General: Low perennial with 1-3 stems from an enlarged base. Leaves: Succulent, 0.5-1.5” long, linear, circular in cross-section; in a cluster near the base of the stem. Where Found: Open sandstone outcrops. Notes: Fameflowers are also called rock pinks and are able to survive in thin, rocky, dry soil by storing water in their thick, succulent leaves. The brightly colored flowers are short-lived, only opening in bright sunlight for a few hours, usually in mid-afternoon. Walking the Shut-In Trail north of Mt. Pisgah on the Blue Ridge Parkway yesterday, we saw many beautiful wildflowers called Starry Campion and many more with buds ready to open in the coming weeks. This is a beautifully shaped white wildflower on a tall stalk with a series of four whorled leaves. It is easy to see how it got the name stellata (starry) because of its shape and fringed edges that look like rays of light. This flower should be present for most of the summer. Keep your eyes open for the Starry Campion. General: Perennial with sparsely hairy stems. Leaves: Lanceolate to ovate stem leaves, 2-4” long in whorls of 4. Flowers: Star-shaped, white, about 0.75” wide; 5 fringed petals are wooly at the base, petal blades have 8-12 segments; inflated, bell shaped calyx, formed in loosely branched terminal clusters. Jul-Sep. Fruits: Capsules splitting into 6 teeth. Where Found: Dry woods and clearings throughout eastern U.S.
Notes: The species name stellata is derived from the Greek word, stella, meaning “starry,” and refers to the shape of the flower. Other common names are Widow’s Frill, King’s cure-all, and Thurman’s Snakeroot. Asa Gray (1810-88), a preeminent botanist, wrote that he was told the plant was an antidote to the bite of the rattlesnake and copperhead. The story goes that its use was indicated by markings on the root beneath the bark, where the likeness to the skin of the rattlesnake was seen. General: Perennial herb with a stout, erect stem, branched above. Leaves: Mainly in whorls of 5-20, sometimes alternate on the upper stem, lanceolate, widest at or below the middle, tapering to both ends, 3-7 in. long, 0.4-1.2 in. wide, rough along the margins and on mid-vein beneath. Flowers: Tepals 6, orange to red, heavily spotted with purple from the center to beyond the middle, lanceolate, 2.2-3.2 in. long, strongly recurved anthers, 0.3-0.6 in. long on long divergent filaments, extending well beyond the tepals, flowers usually 3-25, nodding on long ascending or erect stalks, June-July. Fruits: Ellipsoid capsules, 2 in. long, 1 in. wide, flat, brown seeds. Where Found: Moist woods and wet meadows. A mostly midwestern species extending south to Al and MS.
Notes: This species is also known at Michigan’s Turk’s-Cap Lily. This showy plant is often cultivated. Horn, Cathcart, Hemmerly and Duhl, Wildflowers of Tennessee, the Ohio Valley and the Appalachian Mountains. 2005, p 417. Concerning wildflowers, I am often most impressed by the color red. Crimson Bee Balm at Craggy Gardens was one of the first wildflowers that stimulated my imagination when we moved to Black Mountain in 2008. When they bloom in a few weeks there will be a beautiful patch at the parking lot of the Craggy Visitors Center on the trail up to Craggy Field, and also just outside the restaurant at Mt. Mitchell State Park. After years of enjoying our mountains I still enjoy seeing the various Monarda that are now coming into bloom. In addition to the bright red of the Crimson Bee Balm (Monarda didyma), there is the brilliant purple or pink of Purple Bermamot (Monarda media) and the white of Wild Bergamot (Monarda fistulosa). All of these mints are here to enjoy as beautiful plants and also mint tea. General: Perennial Herb with hairy nodes. Leaves: Opposite, stalked, ovate to deltoid-ovate to lanceolate, 3-6 in. long, serrate along the margins and nearly rounded at the base, sometimes slightly tapered. Flowers: Showy, scarlet to crimson, odorless, 1.0-1.6 in. long, 2-lipped corolla, upper lip narrow, nearly straight, upper lip does not have an obvious tuft of hairs, showy, reddish bracts, in terminal flower heads, July—Sep. Fruits: Brown to blackish nutlets, 0.06 in. long. Where Found: Moist mountain woods and bottomlands. A mostly NE species extending south in the mountains to GA.
Notes: This plant is a favorite of hummingbirds owing to the color of the blossoms and the tubular flowers. Not many kinds of butterflies are attracted to this plant, although long-tongued butterflies including the Cloudless Sulphur and Eastern Tiger Swallowtail are exceptions. Their tongues are sufficiently long to extract the nectar. The Boston Tea Party in 1773 led to a shortage of tea in America, and this plant’s leaves were used widely as a substitute for imported tea. Horn, Cathcart, Hemmerly and Duhl, Wildflowers of Tennessee, the Ohio Valley and the Appalachian Mountains. 2005, p 264. Shooting Star is one of those wildflowers that always surprises me. I usually don’t go looking for it, but when I come across it, I stop in amazement. Humans have always been intrigued by the stars in the sky; this flower looks like a shooting star and this gives it a name. Some friends showed me the Shooting Stars below during a hike to Rattlesnake Lodge. You can access this trail from the Blue Ridge Parkway at Tanbark Tunnel, the first tunnel north of Asheville on the BRP. We came upon a large bed of Shooting Stars and Wood Betony. It was a long walk up the mountain, but it was worth it. Leaves: Basal, rosette, mostly oblanceolate, to 8” long, reddish at the base. Flowers: White, rarely pink or lavender; 5 swept-back petals expose the 5 stamens and yellow anthers, which form a pointed beak (or “star trajectory”); borne in a cluster at the top of a naked stalk (scape) that may be 6-20” tall. April-June. Fruits: Ellipsoid capsules, about 0.5” long, dark red seeds are variously flattened or angled. Where Found: Rich, moist, wooded slopes; also meadows, open woods, praries, and limestone bluffs from MN to FL. Notes: The genus name Dodecatheon mans “twelve gods.” In Greek mythology, the primrose was under the care of the 12 gods of Mt. Olympus. The common name refers to the striking flower with a petal formation that resembles a star shooting across the sky. Horn, Cathcart, Hemmerly and Duhl, Wildflowers of Tennessee, the Ohio Valley and the Appalachian Mountains. 2005, p 132. Common Wood Sorrel is a weed in my yard with a yellow flower. I was surprised to find the less common Mountain Wood Sorrel on a trail called the Mt. Hardy trail at MM425 on the Blue Ridge Parkway. The leaves are much larger and the flower is white with pink and yellow highlights. Yesterday it was in full bloom and was the highlight of our hike. In this “in-between” time when the spring flowers are done and the summer flowers are just beginning, it was a delight to see. Now that it is a clearer species in my mind, I will look for it, although the book says it is infrequent and found mostly in the high mountains. If you are out hiking this week, keep your eyes open for this beauty. Leaves: All basal, long-stalked, in a whorl of 3 heart-shaped leaflets, resembling clover. Flowers: 5 white petals heavily veined with pink with a yellow spot at the base, notched at the tip (sometimes quite deeply), 0.5” long; occur singly on stalks 3-6” long. May-August. Fruits: Longitudinally dehiscent capsules, tapered to a point; seeds have a large basal aril that aids in seed dispersal. Where Found: Rich northern woods, esp. spruce-fir forests. Infrequent. Notes: Sorrel is German for “sour,” which refers to the pleasantly sour taste of the leaves. Wood sorrels are common called sour grasses and sour clovers. Being rich in vitamin C, the leaves are a popular addition to salads and have been used in the past to treat scurvy. In recent times, however, it has been discovered that ingesting too much oxalic acid, the ingredient responsible for the sourness, inhibits calcium absorption, so wood sorrels should be taken in moderation. Horn, Cathcart, Hemmerly and Duhl, Wildflowers of Tennessee, the Ohio Valley and the Appalachian Mountains. 2005, p 202. You know summer is here when Fire Pink begins to appear in strange places: ditches along roads and streams, in your yard, on the highest mountains. Its brilliant red color and unusual star shape draw everyone’s attention. Related in my mind, but not in botanical terms, is Indian Pink with its similar brilliant red tube with a bright yellow interior. I have seen Indian Pink only in my yard where I planted it several years ago and at the Asheville Botanical Gardens. Let me know if you find Indian Pink in the wild. In the meantime we can enjoy the common Fire Pink. Following in the weeks ahead will be Bee Balm, Cardinal Flower, and other brilliant red flowers that seem to be on everyone’s favorite wildflower list. General: Perennial herb with downy and sticky stems. Leaves: Opposite, entire, basal leaves form a rosette and are stalked, oblanceolate to spatulate to 4 in. long, stem leaves are opposite and narrow, 2-6 in. long or longer. Flowers: 5 regular parts, 1-2 in. wide, richly scarlet red, narrow, notched petals, cream-colored stamens protrude from the center, sticky calyx, open inflorescence with several flowers growing on thin stalks from the axils of the upper leaves, April-June. Fruits: Ellipsoid capsules, 0.5-0.7 in. long, splitting into 6 teeth. Where Found: Open woods and rocky slopes from NJ to MN and south to GA, Al, and AR. Notes: The splash and brilliant red in spring makes the Fire Pink one of our most popular and conspicuous wildflowers. The scarlet flowers are favorite nectar plants of hummingbirds. Historical reports tell that Fire Pink has been used as a worm-excellent (vermifuge). Our Black Mountain Wildflower Walkers found the Largeleaf Waterleaf in bud on our walk several weeks ago. On Monday of this week, I found the plant in full bloom on the Mountain-to-Sea Trail north of Ox Creek Road that goes from the Blue Ridge Parkway to Weaverville, NC. We see Waterleaf plants during most of the spring and summer season, but I have seldom seen the flower. Hopefully I will remember this plant later in the summer when the flower is long gone. I really like the Latin name because it fits the plant: Hydro (water), phyllum (leaf), macro (large), phyllum (leaf). It is also fun to say. General: Perennial herb, very hairy. Leaves: Alternate, 4-10 “ long and 1/2-2/3 as wide, mottled, pinnated divided with 7-13 coarsely toothed lobes. Flowers: White or pinkish, 0.3-0.5” long, 5 lobes 1/2 the length of the corolla tube, stamens extending another 0.33”; first appear as a round cluster of hairy buds, May-June. Fruits: Rounded capsules surrounded by the calyx; 1-3 seeds with wrinkled surface. Where Found: Rich, moist Woods from PA to IL and south. Notes: The name “waterleaf” refers to plants of the genus (Hydrophyllum) which have watery stems or leaves and may also refer to the mottled leaves that appear water-stained.This species name macrophyllum means “large leaf,” and accurately described the plant with its large, hairy leaves. Notice the blotchy, light green, mottled pattern characteristic of waterleaf species. Horn, Cathcart, Hemmerly and Duhl, Wildflowers of Tennessee, the Ohio Valley and the Appalachian Mountains. 2005, p 244. Puttyroot is a common orchid now blooming in western NC. In the winter we recognize it by its basal leaf of white and green stripes. In spring the leaf dies and is replaced in May and June with a stalk and many small flowers. It is hard to miss along the Mountains-to-Sea trail and other places where the soil is right. Orchids are among the most specialized plants and depend on the right fungus to help them grow and the right pollinator for fertilization. Watch for this orchid on your hikes this month. General: Perennial herb from underground bulbs, flower stalks sheathed at the base. Leaves: Solitary, wintergreen, pleated, bluish green, oval, 4-8 in. long with silvery lengthwise veins, emerging in autumn and withering by early May before flowers develop. Flowers: Irregular, various shades of green, yellow, and brown, 2 arching petals, 3 spreading sepals, whitish lip has pale magenta markings and lengthwise crests, flowers in a loose cluster at the top of the scape. Flowers often open only slightly. May-June. Fruits: Hanging, ellipsoid capsules, 0.6-0.9 in. long. Where Found: Rich, moist soils of alluvial floodplains and deep humus pockets of mature woodlands, from northern AL and AR to the Great Lakes in most of the eastern U.S. Frequent. Notes: This plant gets its common name, Puttyroot, from a sticky paste made by crushing the bulbs and roots, that was used to mend broken pottery. The other name, Adam and Eve, refers to the underground bulbs or corms, which almost always occur in pairs. Technically, the Orchid Family is defined by the fusion of pistil and stamens into a solitary column. 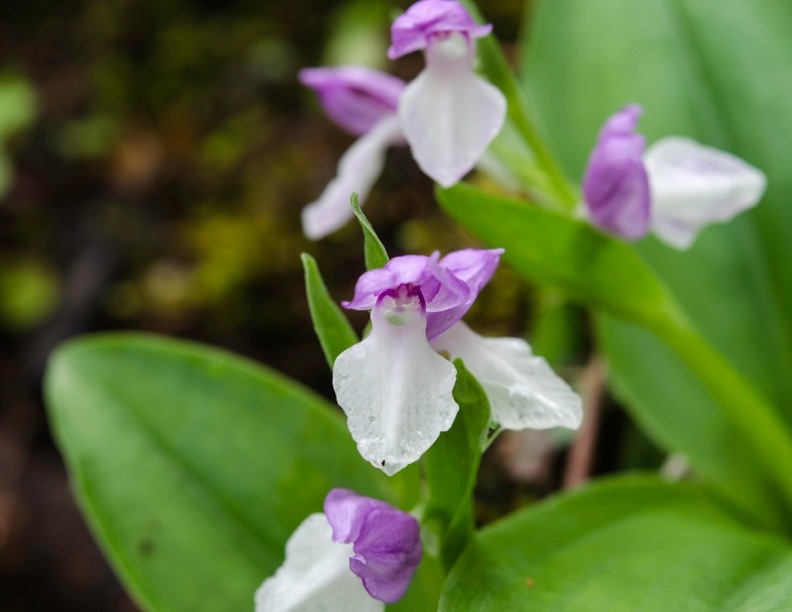 The family name comes from orchis, Greek for “testicle,” the name given to the European Green-Winged Orchid (Orchis morio) for the shape of its paired tubers. Based on the Doctrine of Signatures (the belief that whatever a plant looked like, it could cure), orchids were widely esteemed as aphrodisiacs. Horn, Cathcart, and Duhl, Wildflowers of Tennessee, the Ohio Valley and the Appalachian Mountains. 2005, p 448. The first time I saw dozens of Painted Trillium at Graveyard Fields on the Blue Ridge Parkway, I was on a bird count for the Audubon Society and I was distracted by these beautiful wildflowers. I have loved them ever since. Right now dozens of Painted Trillium are blooming at Graveyard Fields and along the Mountain to Sea Trail at Black Balsam Road. Trillium are amazing plants. The blooms we see are the result of 8-10 years of growth from seed to mature plant. Seeds are distributed by ants and tend to populate an area within the walking distance of an ant. Ants feed the elaiosome or outer layer of the seeds to their larvae and then bury the seeds which creates a perfect location for germination. The fancy term for this is Myrmecochory, or ant plant seed dispersal. I hope you find these beautiful plants on one of your hikes. Unfortunately, they will be mostly gone by June 1, so hurry up to the mountains. Leaves: 3 Whorled, entire leaves, bluish or copper green, ovate, 2-5 inches long at flowering time, sharply pointed, short-petioled. Flowers: 3 regular parts, white with a red, v-shaped; blaze near the base, April-May. Fruits: Scarlet, ellipsoid to ovoid berries, 0.5-0.9 in. long. Where Found: prefers cool coniferous forests or acidic woods with scattered laurel, galax, and rhododendron, eastern US and SE Canada. Infrequent. Notes: The species name undulate refers to the wavy or undulate margins of the petals. The bi-colored petals are a unique feature of this flower. Attempts to cultivate this species outside its native range are rarely successful. Horn, Cathcart, Hemmerly and Duhl, Wildflowers of Tennessee, the Ohio Valley and the Appalachian Mountains. 2005, p 433. Whorled Pogonia is blooming in Black Mountain. Last year, Joe Standaert showed me a patch of this orchid in Montreat, NC. After looking at it closely, I discovered the same plant in our backyard. I have been watching all spring for it to emerge from the ground. A few weeks ago a purple, hollow stem appeared with a potential bud on it. I watched seven plants emerge every day till now—May 1. Today the flower is opening. Yesterday my neighbor, Fay Yee, texted me to come see her Whorled Pogonia in her yard. She showed me fourteen plants, three of which were in full bloom. So I can add the Whorled Pogonia to my orchid list for western NC and look forward to the years ahead. After the flower passes, the leaves will enlarge into the shape of an umbrella and the seed will be held erect. What a beautiful plant. Thanks to my botany friends who have educated me to look for these jewels hidden in our woods. Leaves: In a whorl of usually 5, oblanceolate, to 3.5 “ long, near the top of the stem below the flower; begin to expand when the flower is fully developed and continue to enlarge after fertilization. Where Found: Various acidic soil habitats, including moist woodlands, in most of the eastern U.S.
Notes: Large Whorled Pogonia is recognizable by its reddish purple stem and sepals, and the fruit stalk that is longer than the fruit capsule. Horn, Cathcart, Hemmerly and Duhl, Wildflowers of Tennessee, the Ohio Valley and the Appalachian Mountains. 2005, p 455. I love native orchids. When I hear about an orchid blooming nearby, I try to get directions so I can find it. This year my first orchid discovery came from a lead by Joe Standaert. He said that there was a Spring Coralroot blooming near the Assembly Inn in Montreat, NC. After searching several spots, I found this inconspicuous plant growing in a flower bed on the left side of the Assembly Inn. It is less than 12 inches high, drab in color, and hard to find. Without help, I never would have found this wildflower. From closeup while lying on the ground I saw that it has a beautiful tiny irregular flower. I am glad to add my pictures to my collection and hope to find it again, along with its closely related flowers that are rare. General: Leafless, saprophytic, perennial herb, without chlorophyll, with erect, slender flowering stems. Tan below to yellow-brown or reddish purple above, sheathed around the lower portion. Leaves: Reduced to a few bladeless sheaths on the lower stem, without chlorophyll. Flowers: 3 sepals and 2 lateral petals reddish brown to greenish yellow, often suffused with purple, converging to form a hood over the lip; lower petal (lip) white with magenta spots, flowers 0.25-0.33 “ long in a loose raceme. April-May. Fruits: Ovoid capsules, 0.4” long, 0.2” wide. Where Found: Moist woods, rich ravines and slopes, swamps and along stream margins in most of the central and eastern U.S.
Notes: Spring coralroot is a saprophyte that obtains nutrients indirectly from decaying organic matter in the soil. Studies show that it has a mutualistic relationship with mycorrhizae fungi found among the rhizomes. With the help of friends, I discovered a new Trillium species (for me)—Trillium flexipes. I was on a hike with a local naturalist group at Big Creek picnic area in the Great Smokey Mountains National Park. We took Route 40 west and exited at the first exit in Tennessee. Soon after I arrived, I discovered this Trillium. I had been looking for it because of the guidance of Joe Standaert. This plant grows mostly in the area of the Great Lakes and south to the Ohio River. There are a few isolated spots where it grows in Tennessee and Alabama. The more I spend time in the mountains with expert friends, the more exciting it is to discover a new wildflower, especially one so beautiful and in full bloom. Maybe you have the same experience. Flowers: White, rarely maroon, 3 petals, 0.8-2.0 in. long, white to pink ovary, protruding, flask-shaped stamens with creamy anthers, longer than the white filaments; flowers solitary, on stalks, 1.6-5.0 in. long; sometimes erect, sometimes bent under leaves. April-May. Where Found: Rich woods from NY to SD, south into MS, AL, and GA. In TN, in limestone regions west of Smoky Mountains to the Western High Rim. Occasional. Notes: Bent Trillium smells like old sneakers! I was most impressed by Viola palmata (Three Lobed or Wood Violet), a beautiful blue violet we found at Table Rock State Park near Cleveland, SC. It was growing in a small area along a small stream. The brilliant color of its flowers, and the unusual leaves caught my attention. According to the book, it can be found over a wide area, although in my experience it is not common. I was glad to enjoy this flower this week and hope you will find it too. General: Hairy, stemless perennial herb. Fruits: Ovoid, purple-brown mottled capsules, brown seeds. Where Found: Woodlands and glades throughout most of the eastern US. Notes: the species name palmate refers to the palm-like appearance of some of the leaves. The flowers of some violets can be made into candy jam, jelly, preserves, and syrup. They can even be made into an acceptable sweet wine. In herbal medicine, used as a tea, violets are said to cure headaches. Horn, Cathcart, Hemmerly and Duhl, Wildflowers of Tennessee, the Ohio Valley and the Appalachian Mountains. 2005, p 99. Mountain Ash (Sorbus americana) is one sure sign of fall on the Blue Ridge Parkway. In spring, it produces interesting white flowers and then, in fall, bright red berries which are loved by some birds such as the Gray Catbird below. In addition to the many colors of the changing leaves, the green leaves and red berries add a richness to the palette of beauty. Keep your eyes open at Craggy Gardens and Mt. Pisgah for Sorbus americana. Flowers and Fruits: The small white, flowers are held in flat-topped clusters and are followed by broad clusters of bright, coral-red berries. Where Found: Cool, moist, open areas; granitic outcrops, higher elevations from Newfoundland to GA.
Notes: Berries attract birds. The fruits (fresh or dried) contain iron and vitamin C. They are also acidic and rich in tannins, however, and should be eaten in moderation (Kershaw). Warning: The seeds of this plant are reported to be poisonous, and those of its close relative Mescal bean (Sophora secundiflora) can be deadly. Sensitivity to a toxin varies with a person’s age, weight, physical condition, and individual susceptibility. Late summer and fall Aster species are difficult to identify because there are so many of them and they often look similar. Even experienced Botanists are reluctant to give a positive ID on plants such as Goldenrod (Solidago), Sunflowers (Helianthus), and many others. One wildflower that is easy even for beginners is Wingstem. Standing 3-9 feet with yellow flowers at the top, Wingstem is unique because of the “Winged petioles” or flaps along the main stem. By feeling the stem, you can be confident that you have identified a Wingstem. It is common; look for it along ditches and in fields where there is sufficient light. One place to see a good stand is at Craven Gap on the Blue Ridge Parkway. Until frost, there will be lots of Aster colors for us to enjoy. General: Coarse perennial herb, stem leafy. Leaves: Alternate, narrowly lanceolate, 4-10 in. long, margins serrate to entire; petioles with wings that extend down the stem. Flowers: Ray flowers yellow, 2-10, irregularly spaced, reflexed, 0.4-1.2 in. long, disk flowers yellow, loosely arranged, forming a sphere 0.4-0.6 in. wide; involucral bracts narrow, smooth, reflexed, heads radiate, numerous, in an open, branched inflorescence. Aug-Sep.
Fruit: Achenes, 0.25 in. long, 0.15 in. wide, with broad wings, usually 0.1 in. wide, pappus of 2 short awns. Where Found: Moist thickets and edges of woods through most of eastern U.S.
Notes: Wingstem is named for the winged petioles, which continue down the stem in a wing-like fashion. Wingstems are used as host plants and for nectar by Silvery Checkerspot butterflies. Horn, Cathcart, Hemmerly and Duhl, Wildflowers of Tennessee, the Ohio Valley and the Appalachian Mountains. 2005, p 384. I am probably not the only one who is confused by the late summer wildflowers, especially the members of the Aster or Composite family with multiple, tiny flowers on a tall stem. Several species that can appear similar to beginning wildflower watchers are Joe-Pye Weed, White Snakeroot, and Boneset. All of these flowers are 3-6 feet tall with multiple stem leaves and almost indistinguishable tiny flowers at the top. To the experienced botanist, the differences are obvious, but for the beginner, it takes time to notice these differences. For example, Boneset has white flowers as distinguished from Joe-Pye Weed’s pink or purplish flowers. Boneset has perfoliate (wrapped around the stem) opposite leaves that are hairy and rough-looking as distinguished from White Snakeroot which has toothed leaves with long petioles (stems). Since I learned these differences I have noticed Boneset often this year. In addition, there are multiple species of all these plants which I will save for after I gain more experience. General: Erect perennial, stems shaggy-hairy. Leaves: Opposite, bases united around the stem (connate-perfoliate), lanceolate, 3-8 in. long, 0.6-1.8 in. wide, resin-dotted, pinnately veined, sparsely hairy on the upper surface, densely hairy beneath, tips acuminate, margins crenate-serrate. Flowers: Ray flowers absent; disk flowers white, usually 9-23, involucral bracts acute to acuminate, hairy, glandular, often white-margined; Aug-Oct. Fruits: Resinous-glandular achenes; pappus a tuft of white bristles. 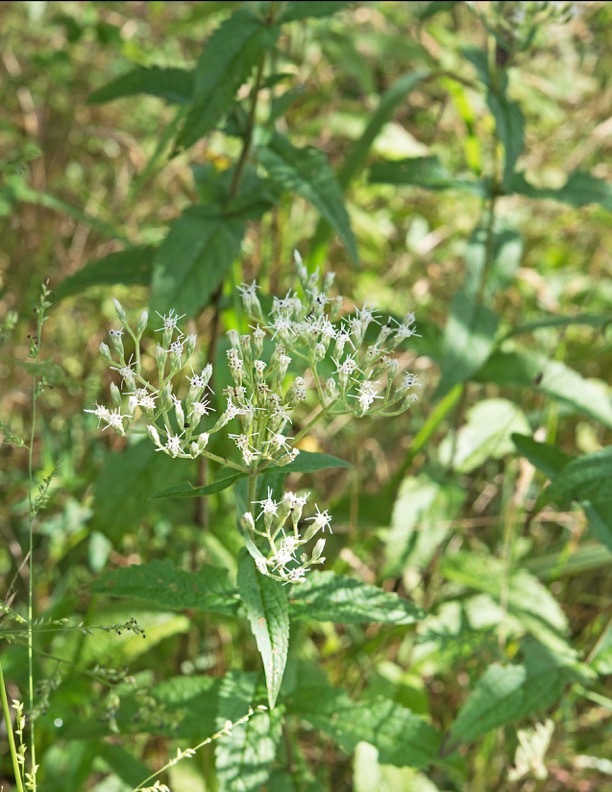 Where Found: Moist to dry woods, fields, and waste places throughout the central and eastern U.S.
Notes: This plant was given the name Boneset, because it relieved “the deep-seated pain in the limbs” caused by influenza. The leaves and flowers were widely used by Native Americans and European settlers to induce nausea and vomiting, as well as for treating fevers, epilepsy, arthritis, malaria, and other ailments. Horn, Cathcart, Hemmerly and Duhl, Wildflowers of Tennessee, the Ohio Valley and the Appalachian Mountains. 2005, p 344. Since I first discovered Grass-of-Parnassus in 2014, it has been one of my favorite late summer wildflowers. The flower is about an inch or so across with distinctive greenish veins on a white background. The plant grows in wet areas and rocky slopes. These pictures were taken at Wolf Mountain Overlook, MM 424, Blue Ridge Parkway, near Asheville, NC, a favorite spot for botanists because of its beautiful and rare plants. When you drive the Parkway this fall, stop at Wolf Mountain overlook and walk across the road to the rocky face and enjoy this beautiful wildflower among others. Leaves: Kidney-shaped basal leaves, 1-2” wide, almost as long, entire, on long stalks; each flowering stem has 1 sessile leaf, similar but smaller, near the middle of the stem. Flowers: Solitary flower on each stem, 5 white petals, about 0.5” long, prominently grayish-veined, narrow-stalked; 5 stamens with anthers are separated by 5 shorter, sterile ones, Sep-Oct. Fruits: Capsules with 4 valves, numerous seeds. Where Found: Swamps and seepage slopes. From AR and eastern TX, east to VA and GA.
Notes: Though these plans do not resemble grass, the Parnassia genus was named by Dioscorides, a botanist of ancient Greece, after a grass-like plant that grew on the side of Mount Parnassus in Greece. This oddity comers from centuries of confusion over the translation of the word for “green plant.” The species name asarifolia means “leaves resembling Asarum or Wild Ginger,” and fortunately, this part of the name is appropriate. The distinctive lines on the petals act as a guide to attract pollinators. Horn, Cathcart, Hemmerly and Duhl, Wildflowers of Tennessee, the Ohio Valley and the Appalachian Mountains. 2005, p 142. Newcomb’s Wildflower Guide, Little, Brown, and Co, 1977, p 142. Mid- to Late-August sees the appearance of the Gentian family. We have four species of Gentian flowers in western NC. Some species are limited to the high mountains at Mt. Pisgah and the south Parkway and Mt. Mitchell. I am featuring the Bottle Gentian (Gentiana clausa) in this Wildflower of the Week. But we also have Stiff Gentian (Gentianella quinquefolia), Striped Gentian (Gentiana villosa), and Balsam Mountain Gentian (Gentiana latidens) in the region. I have seen three of these species this week; their pictures are below. The flowers are unique because they are beautifully blue, they stand upright and are never quite completely open. Some appear to be closed like the Bottle Gentian. Pollinators have to force their way inside in a similar way to how bumblebees enter into Turtleheads. I hope you get to see and enjoy these interesting flowers this summer. Silene ovata (Fringed Campion), is a very rare wildflower in the Pink family, related to Silene stellata (Starry Campion). These wildflowers were found along the Mountain-to-Sea trail north of Craven Gap. I have found these beautiful wildflowers in only one or two locations in western NC. It is exciting to walk along the trail and discover these rare flowers in bloom. Thanks to the Botanical Club for showing me how to find them in late August. Size: 4-16” tall, 1-2 inches across. General: Perennial herb, rooting at nodes and tips of runners, and forming mats. Leaves: 3⁄4 – 31⁄2” long and 3⁄8 – 1” wide, widest above the middle, opposite, upper surface with raised veins, smooth except for short hairs on the margins and long hairs on the leaf stalks. Flowers: 1 – 2” wide, pink or white with 5 deeply fringed petals. Fruits: An oval capsule about 3⁄8” long, with a toothed opening at the tip. Where Found: Mature hardwood forests with low-acid soils on moist, mid- to lower slopes and small stream terraces. Notes: Endangered. About 30 populations are known, with only a few sites protected. Cardinal Flower (Lobelia cardinalis) is one of the most beautiful August wildflowers. I have about ten plants in my yard that are blooming and I love them. The bright red of the flower is about 3-4 feet high with its delicate irregular petals. When hummingbirds and Swallow-tailed Butterflies stick their long snouts into the tube, the stamen deposits pollen on their body. These flowers are common and are found in many habitats, especially near streams and wet areas. Keep your eyes out for this colorful plant as you walk in the woods or drive down country roads. General: Erect, typically unbranched perennial herb. Leaves: Alternate, lanceolate, 2-6 in. long, toothed margins. Flowers: Intensely red or scarlet, 0.75-1.5 in. long, 2 lipped corolla, lower lip smooth within, borne in a showy raceme; Jul-Sep. Fruits: Ovoid or spherical capsules with brown seeds. Where Found: Wet soil, stream banks and roadside ditches through eastern and southwestern U.S. and southeastern Canada. Notes: This plant’s common name comes from the scarlet flowers, which are the color of the robes worn by cardinals of the RC Church. A favorite of hummingbirds, the flowers are also visited by long-tongued butterflies such as the Spicebush Swallowtail, Eastern Tiger Swallowtail, and Cloudless Sulphur. Native Americans used the roots to treat a variety of illnesses, but especially to rid the body of worms. Although this plant has been used as medicine, it is also very poisonous, and extracts of the leaves and fruit can produce vomiting, sweating, pain, and eventually death. Horn, Cathcart, Hemmerly and Duhl, Wildflowers of Tennessee, the Ohio Valley and the Appalachian Mountains. 2005, p 300. Some friends showed me the place to find the uncommon Three Bird Orchid near Brevard, NC. I went there on Monday and found the flowers limp and unopened. But I went back a second day and found them open and beautiful. I would never have found them by myself because they are so small and fragile, I would likely have overlooked their presence, as I am sure many people have done before. I had to lie flat on the ground to get pictures of these flowers that are only about 6” off the ground and only 1/2” wide. But it was worth it to see the three sepals that someone thought looked like three birds and the lips that must look inviting for the pollinator this flower is hoping to attract. The forests are full of surprising and beautiful things during July (and August) and I hope you find time to enjoy them. General: Small perennial herb appearing delicate and fragile, flowering stems purplish green. Leaves: Alternate, oval, clasping, bract-like, to 0.5” long. Flowers: Pinkish white, 3 sepals and 2 lateral petals similar, oblonceolate, lip petal white, about 0.5” long, 3 lobed and 3 parallel green ridges in the center. Aug-Sep.
Where Found: Rich, damp woodland humus, throughout the eastern U.S. Thinly distributed. Notes: Sometimes the pedicels are not rigid enough to support the flowers firmly, resulting in a nodding effect. Individual flowers last only about 1 day, but many plants in a colony (even many colonies within a sizable area) may have 1 or more flowers open simultaneously, apparently triggered synchronously by the drop in normal nighttime temperature or other factors. Horn, Cathcart, Hemmerly and Duhl, Wildflowers of Tennessee, the Ohio Valley and the Appalachian Mountains. 2005, p 468. I saw a new (for me) native orchid near the Black Balsam Road parking lot on the Blue Ridge Parkway yesterday: Green Adder’s Mouth. This one is small—8 inches tall with tiny flowers about 0.1” wide. How they found the adder’s mouth I will never know. This has been the summer of orchids for me and I love the challenge. So far I have seen 19 out of 42 orchids in North Carolina. There are still several in our area that I would like to see someday. For others, I have to travel to the coast to find them. 42 may seem like a lot of orchids, but there are 20,000 species of orchids in the world, most of them in the tropics where they can often be found as “air plants” growing in trees. Just like we love the Lady Slippers, we can also enjoy the other native orchids blooming this summer in western NC. Leaves: Solitary, smooth, oval to elliptic, 1.5-3.0” long, attached about halfway up the stem and wrapped fully around it. Flowers: numerous, 0.12” wide or less, pale green, inflorescence a terminal raceme, curiously forming a flat-topped cluster of buds above the open flowers until all the flowers on the raceme are mature. May-August. Where Found: damp woods and bogs from S. Canada and eastern U.S. to Florida and Texas. Notes: The genus name Malixis is Greek for “soft,” referring to the texture of the leaves. The species name uniflora is Latin for “one leaf.” The small size of this plant makes it easy to overlook in the field. However, once found, it is easy to identify by its unique, completely green appearance. Horn, Cathcart, Hemmerly and Duhl, Wildflowers of Tennessee, the Ohio Valley and the Appalachian Mountains. 2005, p 457. I first discovered Listera smallii, Appalachian Twayblade, with help from friends in June, 2016 at Craggy Pinnacle on the Blue Ridge Parkway. It was not blooming, but seemed to have buds. So I returned every week for six weeks until it finally flowered in late July. My friends labeled me “The Twayblade Guy.” This year I waited until July to look for this flower and a friend (Susan Jumper) showed me a picture in early July. I went the next week to Craggy Pinnacle and found them blooming in at least ten locations and also on the trail from the picnic area to Craggy Flats. The plant is only 2-4 inches tall and the flower must be less than 1/4 inch. But knowing where it is and when it is blooming is part of the excitement of finding native plants in the Southern Appalachians. Look under the Rhododendron bushes. The pictures below are from this week. Also ready to bloom is the Cranefly Orchid (Tipularia discolor). It has a distinctive green and purple leaf in winter which withers in spring and then the bulb sends up a naked stem with small flowers on top. The blooming stem may be 6-8 inches tall and the flowers are about 1/2 inch long. I have included a picture from Elizabeth’s Trail in Montreat which is a reliable place to find the Cranefly Orchid. Flowers: 1/4” flowers with a wide lip divided into two divergent lobes, their hues a range of greenish brown pastels. Where Found: moist mountain woods, frequently under hemlock or rhododendron. Found at Craggy Gardens and other high elevation ridges. Notes: The Listera genus is named for Martin Lister (1638-1711), an English naturalist. I remember the first time I found Silene stellata or Starry Campion on the trail and thinking “what a beautiful flower.” After I discovered it, it became a marker wildflower for me indicating we are in the middle of summer. 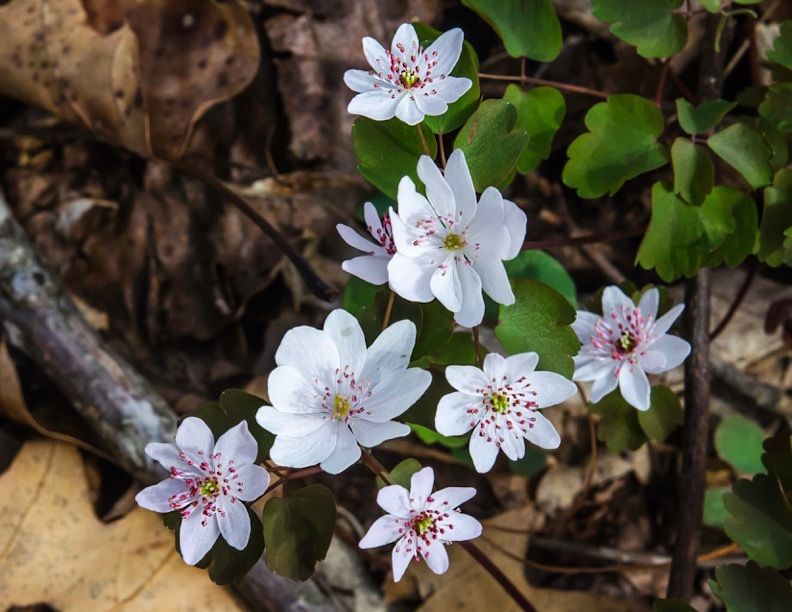 With its distinctive shaped and fringed white petals and the four leaves in whorls on the stem, it stands out among the leafy underbrush along the trail. It has a first cousin called Silene ovata or Fringed Campion that blooms around August 1 and is quite infrequent. I saw it for the first time last summer and hope to find it again. I will include one picture of the Fringed Campion for comparison, although it may become the Wildflower of the Week if I can find one later in the summer. The first two pictures are Starry Campion and the third is Fringed Campion. Starry and Fringed Campion are the same genus as Silene virginica or Fire Pink which is also blooming now along the mountain ridges. Keep your eyes open as you hike the mountain this summer. There are many surprises. Notes: The species name, stiletto is derived from the Greek word, stella, meaning “starry,” and refers to the shape of the flower. Other common names are Widow’s Frill, King’s cure-all, and Thurman’s Snakeroot. Asa Gray (1810-88), a preeminent botanist, wrote that he was told the plant was an antidote to the bite of the rattlesnake and copperhead. The story goes that its use was indicated by markings on the root beneath the bark, where the likeness to the skin of the rattlesnake was seen. I am always thrilled when I find the first blooming Black Cohosh in the wild. This week I found several blooming plants at Craven Gap: some just across the road from the parking lot and some along the MTS trail north about 1/4 mile. This showy wildflower is taller than I am when it is blooming with a stalk of flowers with bright, white stamens. The leaves are similar to several other plants and not easy for beginners to pick out except when in flower when it is unmistakable. Look for Black Cohosh on your hikes in the next few weeks and enjoy the show these flower put on every summer. Pictures below were taken yesterday. Size: Flower stems up to 8 ft. tall. Leaves: Both basal and alternate on the stem, 2-3 ternately compound, with broad, sharp-pointed, coarsely toothed leaflets, 2-4 in. long, the terminal leaflet generally 3-lobed. Flowers: About 0.5 in. wide, petals absent, numerous showy, white stamens; flowers have an unpleasant odor, borne in crowded racemes to 12 in. long, on vertical stalks; each flower has 1 ovary (rarely 2), about 0.25 in. long, not on a distinct stalk. May-Jul. Where Found: Rich woods. A NE species extending south into NC. Notes: The genus name, Cimicifuga means “bugbane” (cimex means “bug” and fugue means “flight”), in reference to these plants’ insect repellent qualities. Black Cohosh is also known as Black Snakeroot and Rattlesnakeroot for its use in treating snakebites. Black Cohosh, a popular herb in Europe and the U.S., in commonly used to alleviate menopausal symptoms and pains during labor and after childbirth. Traditionally it has also been used to treat rheumatism, arthritis, asthma, and hysteria, and as a gargle for sore throats. Bumblebees release the pollen by sonic vibrations. Horn, Cathcart, Hemmerly and Duhl, Wildflowers of Tennessee, the Ohio Valley and the Appalachian Mountains. 2005, p 56. Since we live surrounded by Rhododendron all year, we tend to take it for granted when we have a big year of blossoms. 2017 seems to be one of those years. Drive Montreat Road into Montreat and you will see the white Rosebay Rhododendron flowers everywhere. Look at them closely and notice the white and pink colors with yellow and green spots on the upper petal. Last week was the Catawba Rhododendron festival at Roan Mountain with its bright pink-purple flowers that grow only in higher elevations. People come for miles to see these displays of color. Meanwhile we live in a late spring paradise of white flowers and sometimes don’t even notice it. Take time to enjoy the Rhododendron shrubs while they are having a good year. General: A multi-trunked small tree or large shrub. Flowers: 5 regular parts. Rosebay Rhododendron blooms in early summer, about a month later than Catawba. Flower color ranges from light pink to white, though white is most common. June-July. Where Found: Very common in the understory forests of slopes in the Mountain and upper Piedmont regions of North Carolina. Notes: the nectar of many members of the Heath family, including rhododendrons, contains poisonous andromedotoxin. Beekeepers must be very careful when deciding the location of their hives in spring. At various times, people have gotten sick from eating toxic honey. Horn, Cathcart, Hemmerly and Duhl, Wildflowers of Tennessee, the Ohio Valley and the Appalachian Mountains. 2005, p 131. Gray’s Lily is an rare wildflower reliably seen only at Roan’s Mountain on the Tennessee-North Carolina border. I have traveled there in previous years just to see this beautiful red lily growing in the meadow near Carver’s Gap. Several friends made the trip this week and sent me pictures. It blooms just after the Catawba Rhododendron Festival around June 15-16. Several of us were lucky to find one Gray’s Lily plant just north of Craggy Gardens this week. It is rare in the Black Mountains so the sighting was exciting. The Gray’s Lily we found is 3-4 feet high with multiple blossoms. In two weeks, the mountains will be full of Turk’s-cap Lilies and they will seem to be everywhere for a few weeks. For this week, we can enjoy the one Gray’s Lily we found and hope it survives and returns next year. General: Perennial herb with a stout, smooth stem. Flowers: Bell-shaped, 6 sepals, red with dark spots nearly to the tip, flared, not recurved or widely spreading, 1.5-2.5” long; anthers not usually extending beyond the tepals; flowers 1-9, head nearly horizontal. June-July. Notes: This species if also known as Bell Lily, Roan Lily, and Roan Mountain Lily. The common name and the species name “grayi” honor Asa Gray (1810-1888), one of the America’s leading 19th C. botanists. Horn, Cathcart, Hemmerly and Duhl, Wildflowers of Tennessee, the Ohio Valley and the Appalachian Mountains. 2005, p 416. Purple-fringed Orchids are in bloom this week. The Small Purple-fringed Orchid is blooming along the road from the Blue Ridge Parkway to Mt. Mitchell State Park at MM355. I recently become aware of the Large Purple-fringed Orchid and it is blooming along the Mountain to Sea Trail north of the Graybeard Mountain Overlook at MM363. I have a particular fondness for native NC orchids and I love compiling a list with pictures. Today’s pictures add to my collection. If you like native Orchids, now is a good time to find some and enjoy them. The pictures below are from today featuring the Large Purple-fringed Orchid (Platanthera grandiflora). General: Showy, erect, perennial herb with a fluted, leafy stem. Leaves: Alternate, entire, 2-5 dark green lanceolate, keeled, up to 8 in. long, sheathing the lower stem, reduced to bracts above. Flowers: Rose purple, often pleasant fragrance; 3 petal-like, spreading, oval sepals, 2 lateral sepals swept back at an angle, 2 lateral petals finely toothed, curved upward, lip petal, to 0.5 in. wide and 0.6 in. long, deeply divided into 3 distinctive, flared, lobed, fringed less than 1/3 the length of the lobe, base of the lip has a dumbbell or bowtie-shaped (never squarish or roundish) opening to the spur and nectary, inflorescence a rounded cylindrical raceme. June-July. Fruits: Ellipsoid capsules, about 0.6 in. long. Where Found: Moist, thin, or open woods, along streams, or in wet roadside ditches of upper elevations. Most of SE Canada, the NE U.S., and south in the mountains to GA.
Notes: This is an exquisite and showy orchid. The species psycodes means “butterfly-like,” presumably referring to the flower shape. Horn, Cathcart, Hemmerly and Duhl, Wildflowers of Tennessee, the Ohio Valley and the Appalachian Mountains. 2005, p 463. If you have a chance to hike along the Mountain-to-Sea Trail that parallels the Blue Ridge Parkway, look for the Yellow Clinton’s or Bluebead Lily. It is in full bloom this week and magnificent. I found it along the trail I was walking yesterday with friends. With its broad basal leaves, long stem, and multiple yellow flowers, it clearly dominates the mountainside where it grows. Later in the summer, it will develop a dark blue berry from which it gets one of its names—Bluebead. It is one of many native lilies we find including the Turk’s-cap Lily and Bunchflower. These dramatic wildflowers enrich our summers here in western NC. Leaves: Basal, entire leaves, 4-16 in. long, oblong to elliptic, margins fringed with a few hairs. Flowers: Greenish-yellow, 6 regular parts, nodding, similar petals and sepals, 0.6-0.7 in. long, leafless inflorescence a short, terminal raceme of 3-8 flowers, May-June. Fruits: Ellipsoid, bright blue berries, 0.3-0.4 in. long. Where Found: A northeastern U.S. species extending south only at higher elevations, Infrequent. Notes: Also called Bluebead Lily for its dark blue fruit. The genus Clinton is named for DeWitt Clinton (1769—1828), the 3-term governor of NY. He was responsible for the construction of the Erie Canal and was well known for writing books on natural history. Horn, Cathcart, Hemmerly and Duhl, Wildflowers of Tennessee, the Ohio Valley and the Appalachian Mountains. 2005, p 411. Galax is one of the iconic wildflowers of western North Carolina. It is so common that we often take it for granted. We have some in our yard that we check infrequently. But it is in full bloom right now with its tall raceme of small white flowers. Since it is taken for granted by many, its endangerment is often not noticed. The North Fork Water Valley is patrolled throughout the year because of poachers that are dropped off on the Blue Ridge Parkway and return with garbage bags full of Galax leaves. The leaves are in high demand by nurseries because they keep their green and reddish colors long after they are picked. They are favorites as background green leaves for flower arrangements. Other plants are also endangered by poachers, especially Ginseng, Black Cohosh, Venus Flytraps, and a few others. Those of us who love native plants need to be alert to the dangers and we need to appreciate these plants when we find them, even the common ones like Galax. Leaves: Basal, toothed, 2-6 in. wide, circular to ovate, heart-shaped at the base, long petioles. Flowers: 5 white petals to 0.25 in long, separate, numerous flower in a tall raceme or spike, May-July. Fruits: Tan capsules about 0.4 in. long. Where Found: Moist or dry woodlands, frequently forming ground cover on acidic soils common in southeastern US. Notes: The name, Galax comes from the Greek word, gala, meaning “milk.” urceolata means urn-shaped,” referring to the shape of the flower buds. It was used in a poultice to heal cuts and wounds. The leaves are important for greenery used in Christmas floral arrangements. I love wild Orchids. So far I have seen about twelve different wild Orchids in western NC and SC. I am featuring one of the earliest orchids to bloom in the spring—Puttyroot or Adam and Eve. It has a green and white striped leaf that engages in photosynthesis during the winter and early spring. Then the leaf dies and it is replaced by a 10 inch “scape” of small flowers as seen below. It is blooming now and can be seen along the Mountain to Sea Trail near Craven Gap on the Blue Ridge Parkway. Later in the summer, other orchids will bloom. They are the most specialized wildflowers and the largest number (20,000) of species among the angiosperms. Keep your eyes open and enjoy these interesting wildflowers this year. Southern Nodding Trillium (Trillium rugelii) is blooming now on the Mountain-to-Sea Trail along the Blue Ridge Parkway. Look for a 3-leaved plant with a white flower hanging below the leaves. There are nice examples along the MST trail going south from Craven Gap and many other places along the Parkway. I saw some from my car today when we drove to Max Patch near Clyde, NC. Trilliums are among my favorite wildflowers because they are showy and last only a short time during April and May. Starting from seeds distributed by ants, it takes 7-8 years to reach maturity and produce its first flower. Given its relatively long life and tendency to bloom early before the leaves come out on the trees, it deserves respect from from all of us. I hope you get to see it this spring. Leaves: In a whorl of 3, solid green, rhombic-ovate, 3-6” long and wide. Flowers: White, rarely pink or maroon; 3 petals, ovate, recurved, 1-2” long; stamens often bicolored with white filaments and vivid purple anthers; ovary usually white with purplish splotches; flowers solitary, stalked, nodding below the leaves, April-May. Fruits: Maroon, fleshy, 6-ridged berries, to 0.8” across, with numerous seeds. Where Found: Rich hardwood forests, from TN and NC south in the Blue Ridge and Piedmont, and in AL, GA, and SC in the Coastal plain. Horn, Cathcart, Hemmerly and Duhl, Wildflowers of Tennessee, the Ohio Valley and the Appalachian Mountains. 2005, p 430. Last week I was surprised to find a hillside of Spotted Mandarin (Prosartes maculata) on the Mountain to Sea Trail at MM 379. A small group of us made a special hike to see the Yellow Lady Slippers (Cypripedium calceolus). They were gorgeous as usual, but I did not expect to see so many Spotted Mandarin flowers there along with Showy Orchis (Galearis spectabilis) and Wild Sasparilla (Aralia nudicaulis). Spotted Mandarin is not uncommon, but is often overlooked because it is less showy than some other wildflowers. You have to look closely to find the flowers and then look for the purple spots. Wildflowers are peaking along the Blue Ridge Parkway. Keep your eyes open whenever you hike along our ridges and coves. Size: 8-30 inches tall, 1-2 inches across. General: Erect, perennial herb, upper stem forked. Flowers: Cream to white, peppered with purplish spots; similar petals and sepals (3 each), 0.6-1.0” long; flowers, 1-3, hang like bells from the uppermost leaf axil. April-May. Where Found: Rich woods over neutral or calcareous soils, from; Michigan to GA.
Notes: Also known as Nodding Mandarin, similar to Yellow Mandarin. Its favored habitats are steep wooded hillsides and rich ravines. Horn, Cathcart, Hemmerly and Duhl, Wildflowers of Tennessee, the Ohio Valley and the Appalachian Mountains. 2005, p 413. Pink Lady’s Slippers (Cypripedium acaule) are blooming in Black Mountain on private property. They are one of the fairly common and most beautiful of our native orchids. They depend on partnership with particular fungi and with particular pollinators. Orchids are the most specialized and abundant angiosperms (flowering plants) with 20,000 native species in the world, most of them in tropical climates. Two years ago we visited an Orchid Botanical Garden in Costa Rica and they hosted thousands of plants. The first picture is a fully-blooming plant; the second is a plant just about to open up to the world. Keep your eyes open during the next 2-3 weeks. Pink Lady Slippers could be greeting you just around the next turn in the trail. General: Perennial herb with scapes (leafless flowering stalks). Leaves: 2 alternate, entire leaves, basal, elliptic, 4-10 in. long, dark green, densely hairy, deeply pleated. Flowers: Irregular, solitary, 3 sepals (lower 2 fused into 1) and 2 lateral petals, yellowish green to purplish brown; lower petal (lip) a showy pouch, pink, 1.5-2.5 in. with rose veins, lip opening a vertical front divisions with edges folded inward, April-May. Fruits: Ellipsoid capsules, 1.0-1.75 in long. Where Found: A variety of habitats but mainly in acidic, mixed coniferous and hardwood forests and woodlands recovering from fire or logging from northern AL to southern MN. Notes: The genus name Cypripedium is derived from the Greek Kypris, “Venus,” and pedilon, “a door” or “little foot,” in reference to the shape of the flower. This species is also called American Valerian because, like European Valerian (Valerian officialis), it was used as a sedative to treat nervous conditions and depression. Horn, Cathcart, Hemmerly and Duhl, Wildflowers of Tennessee, the Ohio Valley and the Appalachian Mountains. 2005, p 450. Blooming orchids are a sure sign that spring is in full swing. Yesterday, we found Showy Orchis blooming near the Tennessee line in the Great Smokey Mountains National Park (Big Creek). It is a beautiful pink and white orchid and the earliest of the season to my knowledge. We should start seeing them locally and along the Blue Ridge Parkway trails in the next week or two. They will be followed by Pink and Yellow Lady Slippers, some of the most beautiful wildflowers. Orchids are the largest family of wildflowers (20,000 species) in the world. They are also the most specialized, having developed specific strategies for particular pollinators. The wild species in our mountains are almost impossible to transplant because of their dependence deep in the soil with particular fungi. Let me know if you find a patch of these beautiful wild orchids. Later in the summer we will look for the delicate flowers of Cranefly Orchid, Puttyroot, and Rattlesnake Plantain. Nature is amazing. Size: 3-10 inches tall, 1 inch long. General: Showy, smooth perennial herb from a short, fleshy root; flowering stalks thick, relatively short, sharply ridged. Leaves: Basal, 2, nearly opposite, thick, glossy, dark green widely elliptic, 4-8” long. Flowers: 2 lateral petals and 3 sepals pink to lavender, covering to form a hood; lip usually white; borne in a raceme, April-May. Where Found: Rich, hardwood forests, esp. near streams or at the base of slopes, SE Canada and most of eastern US. Notes: Orchids are experts at tricking insects into their corrollas, which lack nectar. Instead, they have packets of pollen, called pollinia, that cannot be used as food by insects. Orchids attract their pollinators with elaborate deceptions, including distended hairs and papillae on the lips and complicated fragrance lures. In search of food, an insect is tricked into visiting flower after flower, depositing and receiving pollen as it goes. Horn, Cathcart, Hemmerly and Duhl, Wildflowers of Tennessee, the Ohio Valley and the Appalachian Mountains. 2005, p 453. Last night in my dreams, I was working on my Latin pronunciation of wildflowers as I repeated over and over—Thalictrum thalictroides. That is my latest memory exercise for an aging brain that needs to be stretched by learning new things. On Monday and again on Thursday, I felt privileged to find this flower with its showy white blossoms, reddish stamens, and unique leaves. Some experts say this wildflower is common, but it was new to me. Now I hope to find it in other places where I can be surprised. Every day in the mountains, there are surprises waiting for us if we look carefully and take the patience to understand what we are seeing. God’s natural beauty is on display for all of us during this Easter week, and we should be comforted in the midst of discouraging news about the world. Leaves: Basal leaves divided into 9 toothed, rounded leaflets, upper leaves in a whorl, each divided into 3 leaflets with 3 shallow lobes each. Notes: The tuberous roots of Rue Anemone are considered edible, although they may also contain toxic substances. Native Americans are reputed to have used this plant to treat diarrhea and vomiting. Last week I hiked near Saluda, NC and we came across a hillside filled with Trout Lilies. This is a true spring ephemeral because the leaves and flowers come in early spring before the canopy of leaves hides the sun. Then the plant disappears until next spring when it will leaf out and bloom again. So it is a treat to run across this flower on a hike. The leaves are dark green with purple-brown spots and the flower is a nodding yellow flower about one inch across. It is great to discover just one, but a real treat to find a whole hillside. It is often found with Trillium, Bloodroot, early May Apples, Jack-in-the- Pulpit, Spring Beauty, and Golden Ragwort. The pictures below were taken last Saturday. Size: 6-9 inches tall, flower is 0.8-1.6 inches long. Leaves: Opposite, 2 green mottled purple-brown, elliptical, 4-6 inches long, near the base of the stem. Flowers: 6 regular parts, entire, yellow, often spotted inside, strongly recurved, conspicuous anthers, flowers solitary, nodding, March-May. Fruits: Capsules, flat, rounded, or pointed at tip when mature. Where Found: Rich woods in eastern U.S. and southeastern Canada, common. Notes: Plants in the Erythronium genus are often called dogtooth violets because their hard, white, bulblike corms resemble canine teeth. They have been called “phosphorus sinks,” because their roots retrieve phosphorus from the soil and transfer it to the leaves, making it available to herbivores such as deer. Leaves and roots are edible and have medicinal value, but some humans may have an allergic reaction. Size: 6 inches tall, 1 inch across. Leaves: Basal only, on hairy stalks; leaves 1-3 in. wide, 3-lobed with pointed tips. Where Found: Rich upland woods commonly on basic soils. Notes: The genus name Hepatica means “of the liver” and acutiloba means “sharp tips,” referring to the leaf shape. Also known as Liverwort and Liverleaf. Traditionally used for the treatment of liver ailments. I have been in Southeast Arizona for almost three weeks and I have not been out watching for wildflowers. I know there was snow and cold weather here during my absence that may have affected the timing of spring wildflowers. One of the earliest wildflowers to bloom in our area is Yellowroot. I heard from some of my Botany friends about the wildflowers they found on Friday. This included Yellowroot, a shrub with very small flowers that should be blooming right now. Last year, we found Yellowroot along Elizabeth’s Trail in Montreat along with Trillium and Occonee Bell. I will check it out before Thursday and see if this is a good place for our first walk of the 2017. Size: Up to 24 inches tall, tiny flowers. General: Low shrub grows in colonies; roots and inside of the stems are yellow. Leaves: Alternate, pinnately compound with sharply toothed leaflets, the leaves clustered toward the top of the stem. Fruits: Follicles with 1-2 seeds. Where Found: Shaded stream banks in most of the SE US. Notes: The genus name, Xamatjprjoza means “yellow root”; simplicissima indicates that the plant is unbranched. Traditionally, the roots of Shrub Yellowroot were used to make tea to treat a variety of ailments. It is now known that the plants contains berbine, which has many physiological effects on humans. Old Fort is closer to Black Mountain than Asheville, and it is down the eastern escarpment at 1,500 feet. 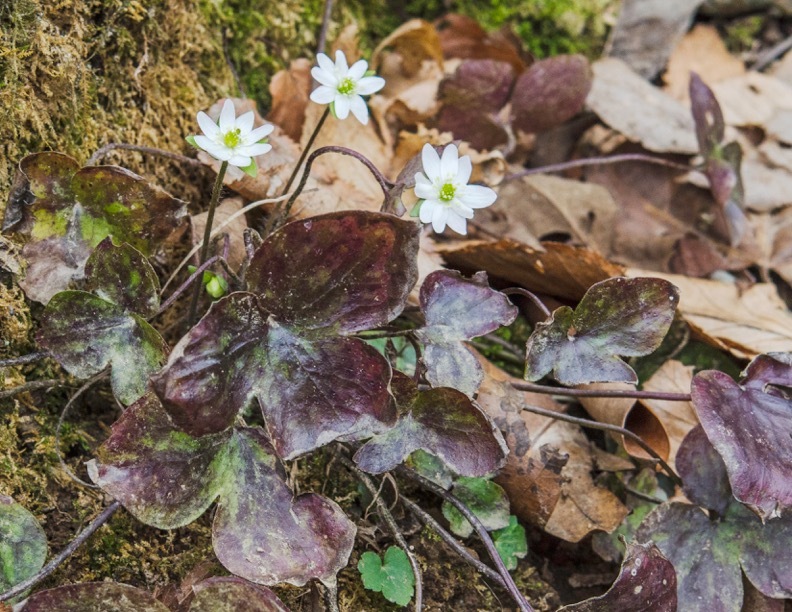 I went looking today on the Catawba Falls Trail and found first of the year early spring wildflowers: Anemone acutiloba (Sharp-lobed Hepatica), Sanguinaria canadensis (Bloodroot), Viola sororia var. sororia (Confederate Violet), and Stellaria pubera (Star Chickweed). Keep your eyes open—Spring is here. During the Winter, we can look for several wildflowers that send out winter leaves for photosynthesis and then the leaves disappear in the summer in preference for a blooming raceme of flowers. I am thinking of Puttyroot (Aplectrum hyemale) and Cranefly Orchid (Tipularia discolor). In the winter absence of wildflowers, it is fun to find these orchid leaves along trails at Black Mountain Recreation Park, or maybe in your yard. I have a Puttyroot in my front yard that I enjoy. Here are some pictures to aid your finding these remarkable plants. Aplectrum comes from the Greek and signifies the flowers are spurless. Hyemale comes from the Latin word hiemalis and means of winter, referring to the observation that the leaves appear only in winter. Tipularia alludes to the form of the Cranefly orchid flower. Tipula is a large insect genus in the fly family Tipulidae, commonly known as crane flies or daddy longlegs. Discolor, of two or of different colors, refers to the two-colored leaf; green on top and purple on the bottom, as seen in the photograph on the right.